Just a few months ago, the City of London Police announced that it had set up a special " Intellectual Property Crime Unit" -- which was immediately, and gleefully, welcomed by the legacy record labels. The whole thing seemed fairly bizarre, given that copyright should generally be a civil issue, and even when it's a criminal issue, at best it should be a federal issue, not a local police issue -- especially when you have local police who almost certainly don't understand the basic nuances of copyright issues. However, in what appears to be an effort to justify their existence, the City of London IP Crimes Unit has jumped into the deep end without looking. Beyond quickly arresting some folks, this week they demanded that EasyDNS take down a website for a BitTorrent search engine, claiming copyright infringement, based on their claims alone. They did not present a court order. They did not present a conviction. They just told EasyDNS to do it -- and (worse) threatened EasyDNS with punishment for not obeying, claiming (falsely) that it could lose its accreditation as a domain registrar. EasyDNS's Mark Jeftovic, who is incredibly well-versed in these issues (having spoken out previously on bogus domain name seizures) posted a fantastic response, which we're going to post at length. There's more than this, but it's worth reading the whole thing. Who decides what is illegal? What makes somebody a criminal? Given that the subtext of the request contains a threat to refer the matter to ICANN if we don't play along, this is a non-trivial question. Correct me if I'm wrong, but I always thought it was something that gets decided in a court of law, as opposed to "some guy on the internet" sending emails. While that's plenty reason enough for some registrars to take down domain names, it doesn't fly here. We have an obligation to our customers and we are bound by our Registrar Accreditation Agreements not to make arbitrary changes to our customers settings without a valid FOA (Form of Authorization). To supersede that we need a legal basis. To get a legal basis something has to happen in court. The request also suggests we look at the whois contact information for the domain (which looks perfectly valid) and go ahead and suspend the domain based on invalid whois data. Again, there's a process for that, you have to go through the ICANN Whois Inaccuracy Complaint process and most of the time that doesn't result in a takedown anyway. What gets me about all of this is that the largest, most egregious perpetrators of online criminal activity right now are our own governments, spying on their own citizens, illegally wiretapping our own private communications and nobody cares, nobody will answer for it, it's just an out-of-scope conversation that is expected to blend into the overall background malaise of our ever increasing serfdom. If I can't make various governments and law enforcement agencies get warrants or court orders before they crack my private communications then I can at least require a court order before I takedown my own customer. In other words, they are ordering us to take down competing websites, with no legal basis, hijacking the traffic, and redirecting it to competing commercial services, all of which are based out of (guess where?) London, UK. This whole thing is fairly stunning, and Jeftovic even suggests he wasn't sure it was real at first, though the headers from the email suggest that it's legit. Furthermore, it appears that this was not a one-off situation. TorrentFreak is reporting that the City of London Police sent out a bunch of these letters to various registrars, targeting a variety of sites -- with no evidence that there's a court order, or indeed any court case at all, with all of them. And while EasyDNS isn't complying, it appears that many other registrars did get intimidated into shutting down these sites. The thuggish behavior and lack of due process isn't that surprising. Combine a "respect my authority" law enforcement mentality, with people who don't have much (or any) experience with the nuances (or history or purpose) of intellectual property issues, and you're going to get this kind of overreaction. Add to that the likelihood that the legacy industry helped provide the extreme (and wrong and misleading) version of copyright law, and is it any wonder that the police seemed to just start demanding websites be pulled down willy nilly just because the police think they're illegal? If you only were to hear the legacy movie studios' and record labels' version of things, copyright is about establishing their very important business model, and anything that threatens that must be illegal. If you see a service that enables some form of infringement, well, that must be illegal, too, right? Of course, they won't realize that copyright is not about establishing a business model for those gatekeepers, that blaming tools & services for the actions of their users is a recipe for killing innovation, and (most importantly) that these things are rarely black and white. And that's why you have due process. The City of London IP Crime Unit has only been around for a little over three months. One hopes that they'll actually learn something before pulling these kinds of censorious, abusive and thuggish stunts in the future. And, while we're at it, it seems reasonable to call for shutting down the whole unit in the first place. IP crimes are not an issue for an ignorant metropolitan police force. The unit never should have been set up in the first place, and this little cowboy censorship action highlights why the unit deserves to be quickly retired. Before certain people come in and vomit their usual idiocy, be aware of these facts. This is a police body issuing orders to parties to shut down and censor other parties all WITHOUT A COURT ORDER. 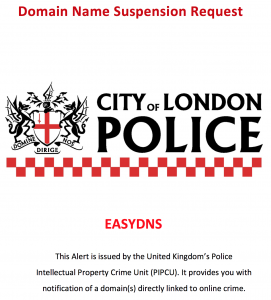 Not only that, but in the case of EasyDNS, it's a BRITISH police body demanding action from a CANADIAN domain registrar to redirect a website based in SINGAPORE (I did a WHOIS search) to competing websites based in LONDON, or the police would complain to ICANN, a body based in the USA. This time, that comment is actually appropriate. I'm actually giving it an insightful this one time.